The Board of Spokespersons of the City Council of A Coruña unanimously approved to join as city council the 2nd World March for Peace and Nonviolence, proposed by “World without Wars and Violence”. In the municipal plenary on April 1, the Mayor of A Coruña, read the institutional declaration approved unanimously in the Board of Spokespersons by the representatives of Marea Atlántica, PP, PSOE y BNG. 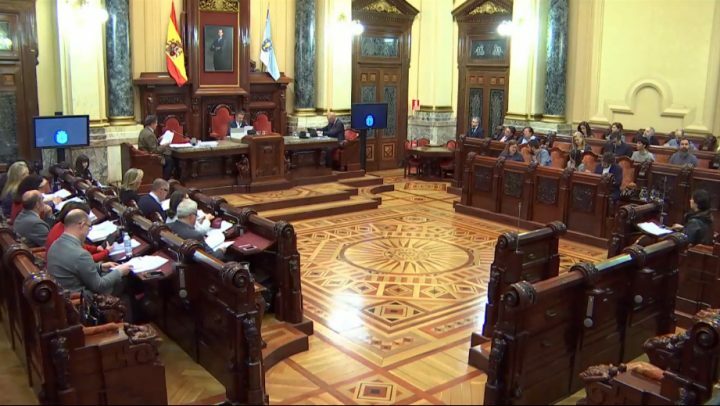 Video of the institutional declaration during the municipal plenary session. “Through this Institutional Declaration, the City Council of A Coruña adheres to the World March for Peace and Nonviolence and declares October 2 “Day of Active Nonviolence in the city of A Coruña. This March will travel the world from October 2, 2019 to March 8, 2020. It will march through all the continents of the planet to denounce the dangerous world situation with growing conflicts, the increase in armaments expenditure while millions of people experience hardship due to lack of food, water, etc. Simultaneously, in hundreds of cities, we will develop activities for peace, and awareness of the different forms of violence. To continue creating awareness that it is only through peace and nonviolence that the human species will open its future … ” reads the statement.